The record shows details such as the cover image, title, author, publication information, and an abstract or summary, if available. Near the top of the record, users can easily see the number of copies that are currently available in the system and how many current holds are on the title. If there are other formats and editions of the same work in the database, links to those alternate formats will display. The formats used in this section are based on the configurable catalog icon formats. The Record Details view shows how many copies are at the library or libraries you have selected, and whether they are available or checked out. It also displays the Call number and Copy Location for locating the item on the shelves. Clicking on Text beside the call number will allow you to send the item’s call number by text message, if desired. Clicking the location library link will reveal information about owning library, such as address and open hours. Below the local details you can open up various tabs to display more information. You can select Reviews and More to see the book’s summaries and reviews, if available. You can select Shelf Browser to view items appearing near the current item on the library shelves. Often this is a good way to browse for similar items. You can select MARC Record to display the record in MARC format. If your library offers the service, clicking on Awards, Reviews, and Suggested Reads will reveal that additional information. Copies are sorted by (in order): org unit, call number, part label, copy number, and barcode. Holds can be placed on either title results or search results page. If the item is available, it will be pulled from the shelf and held for you. If all copies at your local library are checked out, you will be placed on a waiting list and you will be notified when items become available. On title details page, you can select the Place Hold link in the upper right corner of the record to reserve the item. You will need your library account user name and password. You may choose to be notified by phone or email. 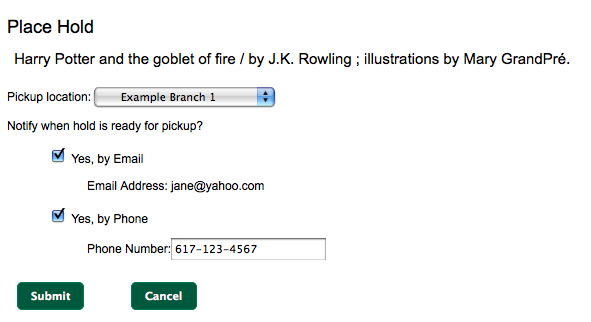 In the example below, the phone number in your account will automatically show up. Once you select the Enable phone notifications for this hold checkbox, you can supply a different phone number for this hold only. The notification method will be selected automatically if you have set it up in your account references. But you still have a chance to re-select on this screen. You may also suspend the hold temporarily by checking the Suspend box. Click the Help beside it for details. You can view and cancel a hold at anytime. Before your hold is captured, which means an item has been held waiting for you to pick up, you can edit, suspend or activate it. You need log into your patron account to do it. From your account you can also set up a Cancel if not filled by date for your hold. Cancel if not filled by date means after this date, even though your hold has not been fulfilled you do not need the item anymore.